Pastrami is probably one of my favorite meat preparations I could never grow tired of eating. Whenever we go to any deli anywhere whether in NYC, Austin, or L.A. that is always my go to sandwich I end up ordering. I love pastrami! The best gourmet pastrami I have ever had is hands down Eleven Madison Park. This is basically their recipe from the second edition of the EMP cookbook. When I went and had dinner there this pastrami was melt in your mouth delicious. They said that they researched all of the great pastrami’s in NYC and worked on their recipes based on those they researched. I thought when I ate it that it was sous vide because it was so tender. They didn’t sous vide it but they do use the combi oven to reheat for each portion which allows the meat to be extremely moist. Again this is their recipe pretty much I did leave out the honey in the brine because I didn’t use that in mine. I also smoked mine in the green egg and then held in my oven until I was ready to serve. Here is the recipe I hope you enjoy! Place all the ingredients for the brine except for half the amount of water. Bring to a boil and simmer for 5 minutes. The allow to cool completely ( you cold add ice to the brine to cool it down fast). Once cold, pour the brine into a container that can hold 2 briskets with the brine. Add the briskets and the rest of the water so that the briskets are completely submerged. You can add a weight to the brine or cover the whole container with parchment paper to keep it submerged. Place the brined briskets into a refrigerator. Allow the briskets to brine in the refrigerator for 5 days. Then take out and since of all the spices and herbs. Take your spices and grind in a coffee grinder until coarse (not dust or powder). Season your briskets heavily with the spice mixture. Bring your big green egg up to 250 degrees. Smoke your brisket for roughly 12 hours or until the internal temperature reaches 180 degrees. 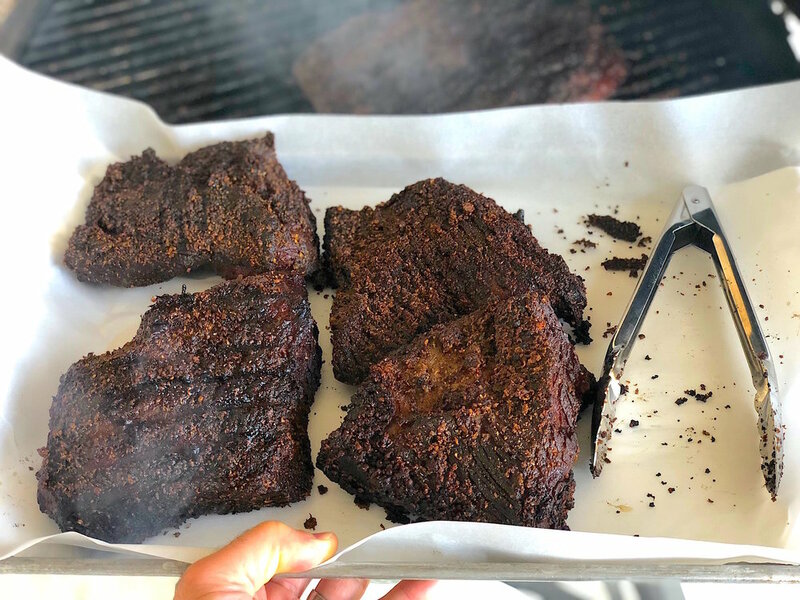 At this point it is a great idea to wrap your briskets in parchment paper and foil and hold them in your oven at 150 degrees until you are ready to eat the pastrami. I hope you enjoy this as much as I do.